Twenty some years ago my husband, 2 young sons and I moved from our cramped 16-foot wide attached row house in Brooklyn’s trendy Park Slope to a free-standing, 7-bedroom Victorian house in the Ditmas Park section of Flatbush with stained glass windows, pocket doors, original wood paneling, a back yard, front porch, driveway and 2-car garage in a little-known, tree-lined neighborhood about 10 minutes away – on the other, high-crime side of Prospect Park. Friends thought we’d taken leave of our senses! 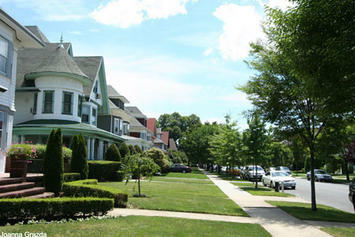 Built early last century, our neighborhood Long has been known for its architecture, with the largest concentration of Victorian houses in America. It’s the kind of neighborhood sensible new urbanists dream about it; the only block in New York with subway stations at each end. This was a tribute to the clout of the neighborhood's original developers who had a strong commitment to building “suburbs in the city,” and secured the best in public transportation for their customers. Driveways help preserve the neighborhood’s low density, while also allowing ample street parking. But before and after WWII, entire blocks of houses were torn down and apartment buildings erected in their place. Today, blocks of beautiful, 3-story Victorian houses with large front porches alternate with blocks of 5 and 6-story apartment buildings. Little changed even after the extraordinary Giuliani/Bratton efforts brought down crime, little changed in the mid-1990s. The district’s once thriving shopping street, Cortelyou Road, still had no bank, no coffee shop, no diner, no sit-down restaurant, no children's store, no real estate office. So there wasn’t much pedestrian traffic - or “eyes” - on the main commercial street, still dominated by 99 cent stores competing with 97 cent stores. Most neighborhood residents, if possible, shopped elsewhere. Frustrated by this situation, in 2001 I founded “Friends of Cortelyou,” a (very) small group dedicated to recruiting new businesses to our commercial strip. A couple of “friends” and I went to lunch, dinner, and coffee at places that we liked in other neighborhoods in Brooklyn. We introduced ourselves to owners and managers as Friends of Cortelyou, trying to convince entrepreneurs to expand into our still “below the radar” neighborhood. To us, the broader, social implications of local shopping were clear; people who walked to local stores on local streets, instead of driving or taking the subway to more developed neighborhoods would generate the everyday interaction that defines a lively neighborhood. Cortelyou’s commercial strip is only 7 blocks long, and a few new stores could have a significant impact. I figured that someone who had taken a chance in Brooklyn’s Ft. Greene, that edgy, racially (and income) diverse neighborhood might see the potential in ours which US News and World Report described as the “most diverse neighborhood in America.” One owner, a half Martiniquen, half Jewish former Parisian was hooked; he saw the possibilities for commercial development and knew first-hand the advantages of being first (namely, cheap rent and “buzz”). The former Parisian negotiated to take over the lease of an existing corner bar. When he ran into trouble securing “the last $30,000”, we put out a call to about 40 neighbors to raise the last start-up capital. Thirty six different neighbors agreed to loan (or give) $1000 each to back someone who would open a new restaurant in our neighborhood! One incredible woman, Susan Siegel, decided she wanted to bring a farmers market to the neighborhood. She worked on this full time, and a year later it opened! Some Cortelyou grocers objected to having it on their strip; a few vocal homeowners objected to unlocking a public school yard and using it to house the market. Ironically the fight over the market swelled into a local “pro-development” movement, made up of people alive to the new possibilities, and sparked a neighborhood newsletter. Once it opened in 2002, the Farmers Market became an informal community center, a literal common ground, for our neighborhood. The Market became a place where the full range of neighborhood residents could come together to buy fresh fruits and vegetables and to catch up on what’s happening in the schools, the playgrounds, and stores including a highly successful organic food co-op. Until then, only the homeowners were organized but now new co-op owners, home owners, and renters all came, mingling freely with each other, and with “veterans”, in a way that had not previously been the case. At that time we realized we needed more new and engaged residents. I tried to persuade two local realtors to sell the co-op apartments; they were far cheaper than co-ops in other good (or “good enough”) neighborhoods, and seemed like the way to bring in young or single people. But the realtors were dismissive explaining, “there’s not enough money,” or “too much work” in selling coops to make it worth their while. I realized I’d have to take this on myself. So I got a real estate license, affiliated with a Park Slope broker, and began selling co-ops in one building in our area. Other agents in that office didn’t mind; for them, too, it was too little money and too much work. Selling real estate and developing the neighborhood were two sides of a coin; the combination turned out surprisingly to be more fun and satisfying than I had imagined. Within two years I co-founded Brooklyn Hearth Realty, an agency I currently own with two partners, young, dynamic neighborhood residents who moved here in the twenty-first century. The neighborhood buzz kept growing. Jim Heaton, a local advertising executive initiated an online newsletter, FREND, and also designed a logo for Friends of Cortelyou. We had the logo printed on t-shirts and oversized shopping bags, and sold them to raise money for the few activities we sponsored that required financial support. We initiated and hosted “Welcome Receptions”, at first in our homes, then in the new restaurants that we recruited for the new residents. These turned out to be very popular, and were one more mark of distinction for our neighborhood. Local businesses joined in as sponsors. FREND served to “connect” nearly a thousand people and families to the new initiatives, particularly around the Farmers Market and crime, but the on-line contribution really blossomed in 2003 when Ellen Moncure and Joe Wong revived the Flatbush Family Network (FFN). This site has become an invaluable source of neighborhood and childrearing information for the many young families who live here. For many people moving into this neighborhood, FFN provides an initial introduction and orientation to life in this neighborhood. For those who live here, it’s a convenient, ongoing source of information and support. All this really began to congeal by 2002. New stores began to open on Cortelyou Road. One of the early successes was the Picket Fence restaurant. Picket Fence was followed by a vintage furniture store (opened by Nicole Francis, a staunch FOC member), a Mexican restaurant, a café, a bar, a bagel shop, a dance studio, a real estate office, wine store, furniture store, children’s store, natural food store, new flower shop/bar, and Tibetan Café. Meanwhile the long-established food co-op and the pizza shop both expanded and upgraded. The Farm on Adderley broke new ground in 2005, attracting attention and customers from far outside the neighborhood. The owners of that restaurant opened another a few blocks away the following year, and just opened the flower shop/bar a month ago. Once seemingly on its last legs, the neighborhood now pulses with a contagious energy. That energy gave birth to the Ditmas Park Blog, founded in early 2007 by Ben Smith and Liena Zagare. The blog sends local information and gossip beyond the neighborhood’s families, reaching growing numbers of singles as well. This was the first institution to target singles as much as families, extending the neighborhood's expanding demographic boundaries. Zagare, her finger on the neighborhood’s pulse, went on to found the Ditmas Workspace in summer, 2008. She created a shared workspace in a former doctor’s office. Another former doctor’s office, also on the ground floor of a large house, has a neighborhood yoga studio and several artists working in small, separate spaces. That's the "new use of old space" that's helping to reconfigure our neighborhood for the 21st century. Much of what I’ve described occurred during the boom times of 2002 through the first half of 2008. Although Brooklyn’s market stayed strong through the summer of 2008, we now face an uncertain future in a very volatile economic climate. Perhaps people will stay closer to home, like the woman who stopped in my office on Cortelyou the other day who said, “I’m not going out as much, and trying to save money. So I’m going over to my friend’s with a bottle of wine.” After all, you can save money on transportation and on babysitting by staying closer to home. As I write this, the owner of a successful Manhattan restaurant is looking closely at Cortelyou, hoping to open in a “real neighborhood” where customers support local businesses. No one knows yet where the economy is headed, or what this means for our neighborhood. But we now have a vibrant neighborhood. This is no longer just a location where the houses are a comparative bargain. It’s an area with an identity. Jan Rosenberg taught Sociology at LIU's Brooklyn Campus for 28 years; her studies of other Brooklyn neighborhoods, and of cities, inspired her work in Ditmas Park. She is cofounder of Brooklyn Hearth Realty. Photos courtesy of Joanna Grazda and Mark Gilman.